Moment of triumph for Cardiff Devils. Pic: Helen Brabon. 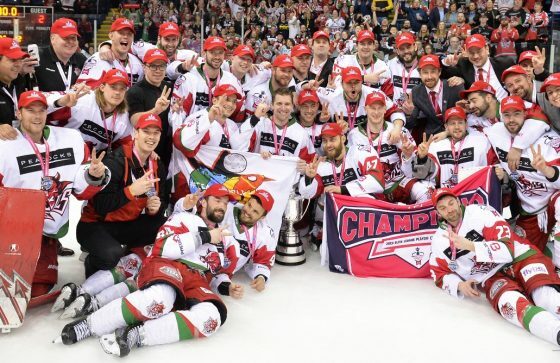 Cardiff Devils are champions again. They retained the Elite League play-offs in a dramatic final at the Motorpoint Arena in Nottingham. Managing director Todd Kelman ran along the corridor from the VIP boxes on the fourth floor at the arena followed by club staff. They were ecstatic. Todd gave me a hand slap as he ran past whooping with joy as the group headed for the Devils locker room. Captain Jake Morissette and his players were singing, laughing, heckling each other and cheering. Andrew Lord went in for a post-season briefing – and that led to more laughter and cheering – before Matthew Myers and Sean Bentivoglio, who had been been chosen for the mandatory drugs test, were able to join their team-mates. When the locker room high jinks settled down Morissette and the players headed for the Salt Box bar in Nottingham to join the Devils fans. There is a close rapport between players and supporters. The best two teams in Britain – Devils and Giants – went head-to-head in front of 7,500 spectators and it was Gleason Fournier who netted the winning goal after 52 minutes 27 seconds. That sparked wild celebrations among hundreds of Devils fans who watched the final and the Welsh team held their nerve to keep Giants out. Mike Hedden had scored Devils first goal, while goalie Ben Bowns was man of the match. “It’s an amazing way to end of a season of ups and downs like you wouldn’t believe, wouldn’t imagine,” said Lord. “The way our guys kept going after finishing level on points with Belfast in the League and losing the title on a count back not many groups could have handled. To pull this off and win the play-offs again is a remarkable achievement. “Maybe it wasn’t our best game, but we found a way to win. These guys care to a man. They care about each other, the Devils organisation and fans. “I am proud to be part of it. I care, it’s my passion. I love it. We have a great ownership group. managing director (Todd Kelman), fan base. And I love the game and enjoy going to the rink every day. “Hats off to Belfast. What a team, what an organisation. What a job Adam Keefe has done. It was a war between the two clubs, back and forth. “They are a first class organisation. Giants gave everything they had in the final and then some. “It’s been an astonishing ride over the last five seasons. The amount of love and passion which goes into this club from fans, the organisation as a whole, management, fans is remarkable. “Something special has been built here. There have been so many great times – and we want more. Cardiff are PredictorBet Playoff Champions for the second successive season. Devils struck first with a goal from Hedden just before the end of the first and that proved to be the only goal of the opening two periods. Kevin Raine was credited with the Giants goal when his shot seemed to fly in after hitting a team-mates shorts before Gleason Fournier struck with the winner. Giants coach Keefe was frustrated that his team allowed Fournier, who he described as ‘the best skater in Elite League’, the opportunity to skate through the middle of the ice and collect the puck. Devils passed the puck superbly and Fournier produced a moment of great skill to control, turn and slip his shot through the legs of Giants’ goalie. Cardiff players were still asking Fournier how he produced that finished well after the end of the match. Devils finished a memorable season on a massive high. Scorers, Devils: Mike Hedden 1+0, Gleason Fournier 1+0, Matt Pope 0+1. Period scores (Devils) 1-0; 0-0 (1-0); 1-1 (2-1). Shots on goal: Devils (on Beskorowany) 6+5+11=22; Giants (on Bowns) 12+10+13=35. Penalties in minutes: Devils 4+6+0=10; Giants 6+0+2=8. Special teams: Devils PK 5/5, PP 0/3; Giants PK 3/3, PP 0/5. Referees: Dean Smith and Andrew Dalton.